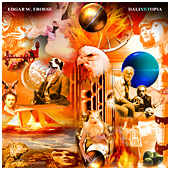 - It has taken many years since Edgar decided to transform his experiences with Salvador Dali into sound. Visiting the painter twice and performing together with Tangerine Dream a couple of times in his villa in Port Lligat/Spain, Edgar is one of the few musicians who knew the man face to face and had quite a few talks about this “rotten religious music” - as Dali quoted it himself. This recording follows the surrealistic landscapes Dali did live in. Also it is inviting all people who admire Dalis works and regard them as one of the greatest paintings of the last century.